If you own an SUV, crossover or minivan and want an all-season tire that can also give you an added increase in fuel economy, then the Bridgestone Dueler H/L 422 Ecopia tire was created with you in mind. The Dueler H/L 422 Ecopia has a symmetrical tread pattern, to go with four larger circumferential grooves. This provides solid traction on either wet or dry pavement. The wider grooves help in channeling water away from the tire’s surface, while providing an excellent contact patch on dry roads. The risk of hydroplaning is greatly reduced, adding better overall safety and more driver confidence behind the wheel. Notched shoulders with intermediate ribs and independent shoulder blocks work together in improving cornering on dry pavement, as well as increasing traction. Bridgestone has used an advanced compound in the tread which is silica based and helps in lowering rolling resistance. This in turn increases the fuel mileage and saves you some money during the long term. Bridgestone’s green technology built into this tire also supports a cleaner environment by emitting less CO2. Continuous sidewall ribs in the Dueler H/L 422 Ecopia increase traction and prevent the tire from heating up. Moreover, the ribs provide a quieter ride, which is useful when you want to make yourself heard at high speeds. Inside the tire, twin steel belts have been incorporated that are spiral wrapped with nylon reinforcement over a polyester carcass. The result is a much stronger tread with better stability at higher speeds, as well as enhanced riding comfort. 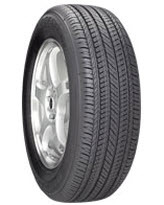 Overall, the Bridgestone Dueler H/L 422 Ecopia offers predictable handling and traction in all-season road conditions. The ride is very comfortable and road noise is virtually zero. You’ll find added fuel mileage to go with a nice 65,000 mile tire warranty, making this a good choice in SUV, crossover and minivan tires. Prices for the Bridgestone Dueler H/L 422 Ecopia Tire range from around $170 for the 16 inch series to approximately $140 for the 20 inch series tires. Below you can find Bridgestone tires coupons so try to get the best possible price. Or try other tires discounts and reviews here. Who Are Bridgestone Dueler H/L 422 Ecopia Tires Designed For? Bridgestone has designed the Dueler H/L 422 Ecopia tires for drivers of SUV, crossovers, light trucks and minivans who are seeking an all-season performing tire that provides good traction with a smooth comfortable ride, as well as improves overall fuel mileage. May not be ideal for heavy snow but then they are not snow tires. Bridgestone Tires warrants the Dueler H/L 422 Ecopia for 5 years or 65,000 miles. Tire uniformity is guaranteed for the first 1/32 inch of wear. Materials and workmanship are covered for 5 years and include free tire replacement during the first 3 years. Bridgestone follows that up with a prorated amount down to the final 2/32 inch of useable tread depth left on the tire. You also have Bridgestone’s 30-day buy it and try it guarantee. If you are not satisfied you can get a full refund or exchange the tire for another Bridgestone model.